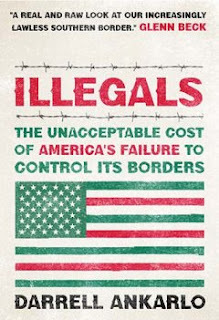 Illegals by Darrell Ankarlo takes an in-depth look at the cost of not controlling our American borders. Not only the cost to us, but to the illegals and their families as well. Darrell Ankarlo, a radio talk show host, goes inside the Mexican border to discover the true story behind the millions who would risk their very lives for a chance to live in America. This book was very well written and informative. In the past I have only seen the burden that the illegals place on Americans, which is reason enough to enforce our laws already in place. But after reading this book and now knowing what goes on on the other side of the border... I can hardly imagine why anyone would support the coming of illegals into America. Ankarlo gives true accounts of people who give money in return for a promise of freedom and prosperity... only to be left to die in the desert. Or those who were promised protection on their journey to the border only to be kidnapped and ransomed for an even greater amount of money. Unimaginable to me is the fact that this is allowed to happen. Allowed by our own government because they won't protect our borders, and allowed by their government because it is such a huge money-making industry. If you really want to be educated, read this book. Not that it will be the last book you read on the subject... but if you want to know the facts on both sides of the border, start here. It is a well written, well researched, and easy to read. Lending your support to anyone coming to this country illegally may not be in their best interest... or ours.